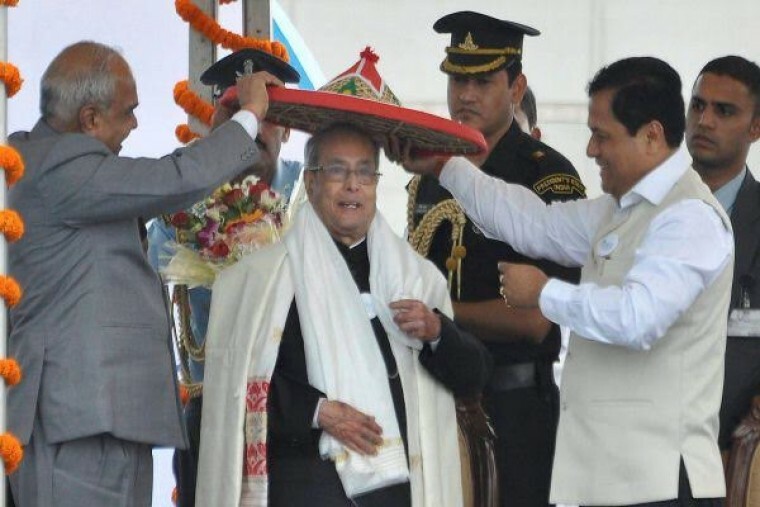 Guwahati, March 31 : President Pranab Mukherjee on Friday inaugurated a five-day Namami Brahmaputra river festival here in Assam and suggested that the state government make it a regular event. Mukherjee inaugurated the programme by lighting a ceremonial lamp at the Kachamari Ghat near Fancy Bazar in Guwahati. "Assam is emerging as an economic hub of East India and South East Asia, which is an important destination for India's investment and trade. India will soon celebrate 25 years of its association with Asean," the President said. Terming Assam rich in natural resources and its people hard working, the President said a "strong drive, right policies and effective implementation" was needed. Referring to the diverse and distinctive culture of Assam, Mukherjee said India's strength was its ability to manage diversity and forge unity. "It was not just the elites but also the common people who were firmly committed to trust, mutual understanding and harmony," he said. The President said the Brahmaputra River is the lifeline of Assam and the region. It was intertwined into the economy, culture and day-to-day life of the people. He complimented the state government for having started "Namami Brahmaputra" as an annual festival to showcase Assam's culture as well as potential. "I do feel it will provide a boost to tourism. Assam's scenic beauty, resources in wildlife, its sanctuaries and the beautiful cultural people has a lot of stories and I do feel this type of regular events with the background stories will attract tourists," he added. The five-day river festival is being organised across 21 districts of Assam through which the mighty river passes. Bhutan's Prime Minister Tshering Tobgay also participated in the inauguration ceremony besides Assam Governor Banwarilal Purohit, Chief Minister Sarbananda Sonowal and senior Assam ministers. The festival is a tribute to the Brahmaputra river which is revered as a lifeline for the people of Assam. Assam's culture, heritage, history, music, food, tourism potential and other aspects would be showcased during the festival which will continue till April 4.